Blue Sky Guttering Ltd clean all types of residential and commercial guttering in Birmingham & West Midlands. Are your gutters clogged, loose, cracked or broken in Birmingham & West Midlands? Blue Sky Guttering Ltd clean and repair all types of residential guttering in Birmingham & West Midlands. Our services include Gutter Lining and all our services are 100% Guaranteed. We offer gutter cleaning services in and around Birmingham & West Midlands. We offer a full guttering service including commercial gutters clean in birmingham and guttering repairs and guttering lining in Solihull & all Birmingham areas. 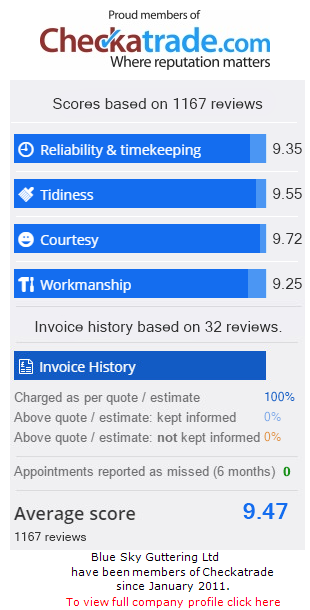 From the information you supply we can give residential customers in Birmingham an accurate fixed price staright away for gutter cleaning and gutter repairs by email. We repair all types of residential and commercial guttering in Birmingham. We specialise in Gutter Lining for Domestic, Industrial and Commercial Customers. We clean and repair and line all types of commercial guttering in Birmingham and all areas in the South East and Home counties. We are delighted to achieve these endorsements as it reflects all the hard work everybody puts in to ensure we provide an exceptional service to all our customers. Consumers can now make an educated choice as to who delivered their gutter care based on independent research undertaken by trusted and established organisations. We take great pride in delivering the highest level of customer service. Alan Baskerville who undertook the assessment for Certified Quality Systems, paid particular tribute to “the investment in people and training that enables us to provide an efficient service to their customers"